Join the lash gang with this treatment from nouveau lashes. Enhance you lashes to get the look you desire without any extensions. Ready to get that #UlitmateLashSelfie! Eyebrow tint and tidy included. Covered up all winter then bare all in summer they have a lot to put up with! The secret can be revealed 7 steps to the perfect celebrity brow. A totally new definition in eyebrow shaping! Open your eyes.... eyelash extensions provide thickness and length to natural eyelashes, enhance the charm and appeal of your eyes. 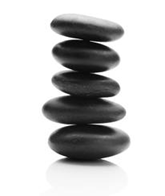 Therapists are able to reach ten times deeper with this massage as the practitioner uses hot stones instead of hands. Designed to help treat areas prone to carry tension. Treat yourself to a relaxing swedish massage, Sports theraputic and remedial massage all using pre -blended aromatherapy oils.